These units are portable (they're easy to move and take with you if you have to change cubicles or switch companies). These units save space (space is at a premium in a cubicle, and positioning your workstation in the corner frees up space). These units are affordable (they will generally cost less than a full-sized standing desk). The five height adjustable desk options I recommend that you consider for your cubicle each offer some unique features. All five of them come highly reviewed on Amazon and elsewhere. ​Here's a quick snapshot of the standing desk options we recommend you consider for your cubicle, and why we chose each one. A longer review and full product specs for each of these products is available lower on this page. I feel you can't go wrong with any of these 5 choices, which will work for small and large cubicles, for L-Shaped desks in larger offices, and for any space where you want to tuck your height-adjustable desk riser into a corner of your workspace. 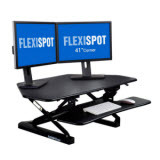 Probably my favorite corner cubicle desk riser, Flexispot's 41" wide offering will fit most standard cubicles while providing a great deal of space for most multi monitor setups and desks where extra surface area is needed. I've personally trialed Flexispot products, using them daily for over 100 hours and they take a beating, perform as advertised, and offer easy operation and height adjustment. The rounded edge of every horizontal surface makes the desk comfortable to work at, and the removable keyboard tray is wider than many, which makes it comfortable to use and easy to maintain an ergonomic wrist and hand position when seated or standing. One drawback to this unit, is that if you use a large, deep keyboard it may not fit on the keyboard tray, which has more than enough space for a traditional keyboard, or one of the sleek, low-profile wireless keyboards. There are 12 different height levels at this height-adjustable corner cubicle desk, and taller people in particular will refer the FlexiSpot offering to Varidesk due to the extra 2+ inches of height available with this stable cubicle corner desk riser. If you work with multiple monitors and need a large corner cubicle desk, you can't go wrong with this FlexiSpot 41" model. Perhaps the best-known brand name when it comes to standing desk risers, it's no surprise that Varidesk's 36 inch corner standing desk converter for cubicles makes our list as one of the best available. This unit, the CubeCorner 36, is the most expensive option on our list, but it's a very solid offering, and if you value brand-name recognition, it's a great choice. The desk is rated to effortlessly raise 35 pounds, which should be plenty for two large monitors, a monitor mount stand, your mouse, keyboard and a cup of coffee (depending upon how big your coffee cup is). One of the key advantages of going with the Varidesk model over one of the other options on this list is that it's the lowest-profile standing desk converter, at just 4.5 inches high when at the lowest setting. 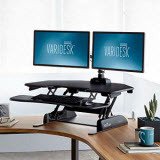 The Varidesk does not have as many height adjustment settings as the FlexiSpot, or the electric cubicle standing desk options, but for most people it will work great. The keyboard tray is nice and wide, and should comfortably accommodate most keyboards and peripherals. One thing some people may like about Varidesk's CubeCorner 36" model is the fact that it's built with GreenGuard, and GreenGuard Gold materials which are all UL Certified to BIFMA standards. It's the heaviest corner cubicle standing desk converter on the list and is very stable. I also found that the ergonomic cutout on the front of the keyboard tray makes it less intrusive in a small cubicle than some of the other options (you'll be less likely to bump into it when turning in your office chair to leave the cubicle). It's a small consideration, but worth mentioning. If you have the funds or your office is investing in standing desk converters for its cubicles, this is a good choice that you'll be very satisfied with. 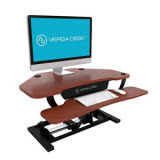 If you're looking for an electric cubicle standing desk converter, the VersaDesk Power Pro is a great option. Why might you need an electric standing desk? Well it can lift and support a lot more weight than a manual standing desk converter (80 pounds vs. ~35 pounds), meaning you can load it up with a larger monitor or pair of monitors. Electric standing desks can also be dialed in more precisely to your proper ergonomic desk height, as they do not have preset levels. You can stop the desk height anywhere you want. 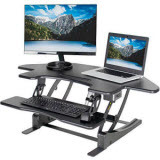 VersaDesk's Power Pro corner cubicle electric desk riser operates well, is made in the USA and features three mounting options for monitor mounts (which is a nice feature that lets you get your cubicle standing desk setup pretty effortlessly. This corner standing desk converter costs the same amount as the high-end VARIDESK model, but it's electric, goes higher and has more height adjustments and carries more than twice the weight, so in my opinion it's a better value. It also comes in five attractive colors (black, white, gray, cherry, and maple), more options than you'll get with most of the corner cubicle standing desks on the market. I like this unit a lot, and while it might not be as well-known a brand as VARIDESK or FlexiSpot, I find it easy to recommend. Looking for extra features in your corner cubicle standing desk? The Vivo has you covered. Not only is this unit affordable, it's electric, and offers a range of features that others in this space do not offer. It's a bigger standing desk converter than the Vivo or Versadesk (43 inches vs 36 inches wide), but the Vivo will still fit comfortably in most cubicles. In addition to the advantages that come with an electric desktop riser (you can dial in the height more precisely), this unit offers a negative tilt option on the keyboard tray, which has proven ergonomic advantages. If you struggle with, or are at risk of carpal tunnel syndrome or tendonitis, this unit is a great choice. There's also a handy accessory slot right in the center of the desk surface, which allows you to position a tablet or smartphone in a tilted or upright position. The VIVO electric desk is not perfect, though. Though it's electric, it cannot lift or support more weight than the manual desk riser options (~35 pounds), which makes the VersaDesk a better option if you have heavy components. The Vivo unit does come with a 3-year warranty, which is an attractive feature to buyers who worry about the electric motor of a standing desk converter, and if you like the features of this corner cubicle height adjustable desk but don't want an electric unit, you can save about $70 by going with the manual option. VIVO is a good company in the standing desk space, but compared to the other units on this list the quality of the materials (mostly the desktop) are not quite as good, which is why they cost less. It's also worth pointing out that the keyboard tray is a bit smaller than some of the other units on this page ... which is fine for most people, but is worth pointing out in any review. Over all this is a great cubicle standing desk option that has a lot to like - especially if the extra features (not available on any competitor) are something you want. Love the large FlexiSpot at the top of this list but work in a smaller cubicle? The 36 inch version is great too. While you can mount 2 ~24 inch or smaller monitors comfortably, on a 36 inch corner desk riser, I like a large curved monitor on mine. The FlexiSpot 36 corner cubicle standing desk riser has plenty of space on its large keyboard tray for a full-size keyboard or a laptop that's up to 17 inches wide. 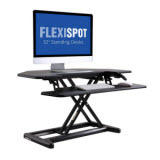 Another nice thing is that this FlexiSpot doesn't have pre-set height adjustments (I'm looking at you VARIDESK), meaning you can stop at any height that's right for you within the available height range of 5.9 to 19.7 inches. I'm a fan of FlexiSpot's products and I've trialed them for extended reasons in my home office. I highly recommend this unit, or the larger FlexiSpot unit as a corner cubicle standing desk option. I'm sure you'll be satisfied with either one.